Hubby finally got tired of the whole gas vs. coal saga and took matters into his own hands. For Mother's Day he gave me the Rolls Royce of gas grills (his words, not mine). I'll admit I was a little dubious, being a staunch coal fan and all, but I must admit that I've warmed up to it. We use it 3 to 4 times a week, and it sure came in handy this last Spring, which was the wettest I've ever experienced. Although the grill was my present, it's Hubby who truly loves the thing. (Funny how that worked out, huh?) He wants to buy accessories for the darn thing! I've already nixed the rotisserie attachment and beer can chicken holder. He's also suggesting stuff we should grill. Yesterday it was pizza. Unlike the beer can chicken holder, this turned out to be a good idea. Who knew grilling pizza would be so easy? We used a pizza stone so we didn't have to worry about the flames burning the crust. We made regular pepperoni pizza and I experimented with a Thai-inspired BBQ chicken pizza that turned out really, really tasty. Unlike a regular pizza, this one is baked only with the sauce (and cheese, if using) and then the toppings are added after. What you end up with is something that feels like a chicken and herb salad on top of thin flatbread rather than a heavy pizza. It reminded me of some of the pizzas we had in Italy, just with an Asian twist. Before you make the curry sauce, you may want to read this post. The pictures may be helpful. To make the curry sauce, saute the curry paste with about 1/3 to 1/2 cup of the coconut cream until the oil starts to separate out. Add the remaining coconut milk. Add fish sauce and sugar to taste. Allow the sauce to reduce by about 1/4 to 1/3, stirring frequently to prevent burning. It will thicken more as it cools. Set aside until needed. Grill the chicken and keep it warm until you're ready to top the pizza. Roll out the dough so that it is thin. Slather it with the curry sauce and top with mozzarella, if using. (I did one with cheese and one without. They tasted about the same.) Bake the crust on a pre-warmed stone in a covered grill (temp should be close to 500F) until done, about 5 to 7 minutes. As the crust is baking, slice the chicken and toss with the chopped herbs. 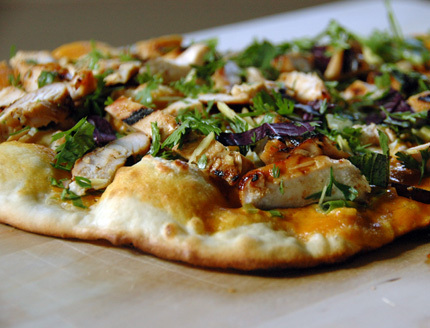 As soon as the pizza is done, top it with the chicken and herbs and serve immediately. It's been so long since I've participated in a blogging event, I thought I'd submit this to Grow Your Own, since the herbs are from my garden. The host this month is Kitchen Gadget Girl Cooks. There's still plenty of time to get your submission in if you want to participate this month!